The aim of this study was to evaluate the impact of three different chromium forms as chromic chloride (CrCl), chromium picolinate (CrPic), and a newly synthesized complex of chromium chelated with small peptides (CrSP) on glucose uptake and metabolism in vitro. In cultured skeletal muscle cells, chromium augmented insulin-stimulated glucose uptake and metabolism as assessed by a reduced glucose concentration of culture medium. At the molecular level, insulin significantly increased the mRNA levels of insulin receptor (IR), glucose transporter 4 (GLUT4), glycogen synthase (GS), and uncoupling protein-3 (UCP3), and these impacts can be enhanced by the addition of chromium, especially in the form of CrSP. 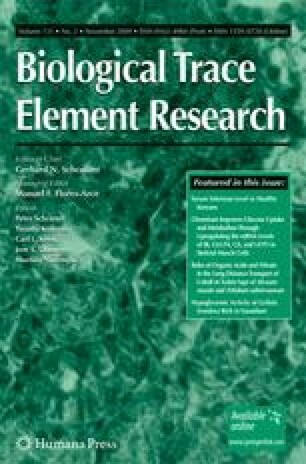 Collectively, results of this study demonstrate that chromium improves glucose uptake and metabolism through upregulating the mRNA levels of IR, GLUT4, GS, and UCP3 in skeletal muscle cells, and CrSP has higher efficacy on glucose uptake and metabolism compared to the forms of CrCl and CrPic. All authors listed have contributed to the work and have agreed to submit the manuscript to Biological Trace Element Research. The manuscript is original, has not been published before, and is not under consideration for publication elsewhere. This article was financially supported by the Program for Changjiang Scholars and Innovative Research Team in University, China, IRTO555.